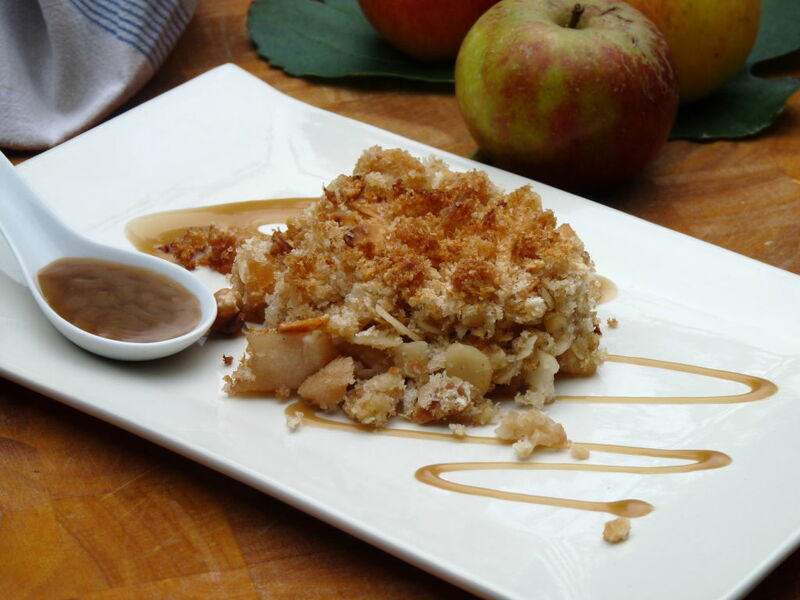 Apple and Nut Crumble with Salted Caramel Sauce. My french mother in law first gave me this recipe for apple crumble over twenty years ago. She used breadcrumbs instead of the traditional English method of flour butter and sugar. The breadcrumbs give the crumble a much lighter and crunchier topping. I have also added nuts and a salted caramel sauce to make this a truly scrumptious pudding. Using a food processor whizz together the bread till it forms crumbs. Add the chilled butter, sugar and nuts and blitz again till they are mixed well then set aside. Take a shallow dish (about 30cm x 18cm ). Peel,core and chop 6 dessert apples into small pieces and place in the shallow dish. Sprinkle over 2 tablespoons of sugar and then top with the crumble mixture. Bake in a preheated oven at 180oc for 25 -30 minutes until the top is golden brown. Remove from the oven and serve with the salted caramel sauce and ice cream. The apple crumble will keep well for 3-4 days. just reheat it in oven .The sauce will keep for at least a week in the fridge and is totally yummy poured over ice cream. Heat the butter, cream and sugar. Bring to the boil and cook for 3-4 minutes until the sugar has dissolved and the sauce has thickened slightly (it want to coat the back of a spoon). Add the salt and keep warm. The sauce will keep for at least a week in the fridge and is totally yummy poured over ice cream.